Dog trainer and behavioral consultant Chris Shaughness has announced the release of “Puppy Mill Dogs SPEAK!” a book that reveals the inspirational stories of people who adopted dogs used as breeders in puppy mills, the adult male and female dogs kept captive their entire life to produce puppies for pet stores. 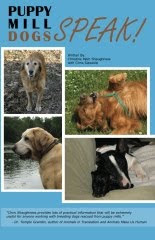 “Puppy Mill Dogs SPEAK!” details the behaviorial and health issues presented by rescue dogs and the puppies they produce, and also provides both practical advice for overcoming these problems and and other training challenges common to all dog owners. This entry was posted in Puppy Mill, rescue on December 27, 2010 by yourfriends.